Participation in the annual POW/MIA Rally held each Memorial weekend in Washington D.C. known as "Rolling Thunder"
Legion Riders are also an excellent tool to teach motorcycle and driver safety in the community and in schools. The recognition and acceptance of ALR groups by local communities has been remarkable. 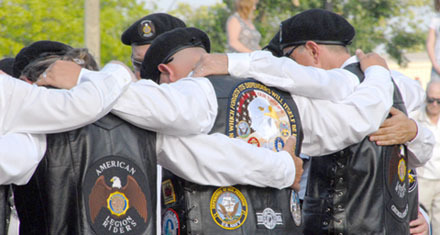 The American Legion Riders in Garden City, Michigan was even honored by the local city council, when they drafted a resolution declaring the American Legion Riders post as a valuable asset to the community. Remember: Motorcyclists can be a very dedicated group of people. When they are also American Legion Family members, you create a win/win situation for your post and community!